There are various weight loss strategies available but a lot of them are only temporary, and people tend to lose weight for a short time only to gain it back again. For the morbidly obese, most of these strategies don’t work, and surgery is the only option. Successful weight loss mainly happens when individuals work together with health care professionals who craft individualized, safe, and effective weight loss programs. Also, most health insurance companies require demonstrated evidence that you have made a serious effort to lose weight before going the surgical approach. Trying out various diets also known as yo-yo dieting can have serious health risks due to significant stresses on the kidneys, hearts and other organs. This is because of the repetitious cycle of rapid weight gain and weight loss. If you decide to go the diet route, the best approach is to work with a health care professional that will customize the right diet for you. An ideal diet is one that restricts calories while maintaining nutrition. The perfect length of time to participate in a medically regulated weight loss program is a minimum of 6 months to 12 months. This increases your odds of success significantly. There is no one weight loss diet that works for everybody. Choose the right one for you that incorporates healthy foods and works for you best. Cutting calories – One of the key factors to reducing weight is by cutting back on the calories consumed on a daily basis. A health care professional reviews how many calories you consume every day from your normal eating and drinking habits and then crafts a customized diet plan to reduce your calorie intake. A healthy male should typically consume 1,500 to 1800 calories per day while a woman requires 1,200 to 1,500 calories per day. Making healthier choices – A healthier diet incorporates more plant-based foods such as vegetables, fruits, and whole grain carbohydrates. Lean sources of protein such as lean meats, fish, lentils, beans, and soy are perfect for your diet. Focus on low-fat dairy products and healthy sources of fat such as canola, nut oils and olive. Reduce your salt and added sugar intake. Feeling full on less – The key to feeling full on less is to understand how energy density can help satisfy you with fewer calories. Every type of food has a particular number of calories in a given volume. Some foods such as processed foods, fats, desserts, and candies have a high energy density which means that a small amount of food has a significant number of calories. Similarly, other types of food such as vegetables and fruits have a lower energy density whereby a significant portion has fewer calories. The smart thing to do therefore is to eat more large portions of foods with fewer calories to help you become full-on fewer calories. This contributes to a greater satisfaction of your meal and mindset. Restricting certain foods – There are particular diets that restrict certain foods such as full-fat foods or high carbohydrates. Depending on what works for you, your health care professional will advise on which foods you can limit or eliminate to make substantial progress on your weight loss journey. Meal replacements – This type of diet plan involves replacing one or two main meals with healthy snacks such meal bars or low-calorie shakes and consuming a healthy balanced third meal that is low in calories and fat. Identifying and avoiding high-risk scenarios. Adopting a realistic approach to weight loss and body image. Setting realistic short term and long term weight loss goals. Keeping a record of diet and exercise patterns. Developing a support network to help you focus on your goal. This can include family members, friends, co-workers or a support group. Regular exercise is an essential component to long-term weight loss. Exercise and daily physical activity help to burn more calories. This is especially useful because as you reduce the number of calories consumed, your metabolism slows down and your body burns fewer calories. This is counterintuitive to weight loss. Thus incorporating exercise is more effective for weight loss. Spending less time watching television. 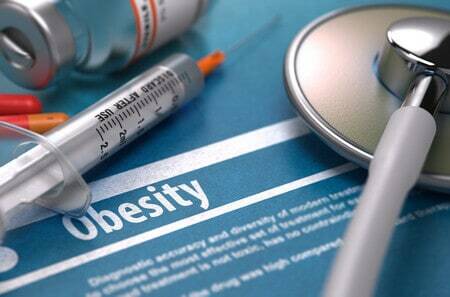 There are certain prescription drugs and over-the-counter weight loss medication available for obese patients. These medicines help people to reduce their appetites and thus eat less. However, for most patients who stop taking the drug, weight gain occurs. 100 pounds over your ideal weight. Learn if you’re a qualified candidate for bariatric surgery today or discover the FDA-approved treatment devices available now.